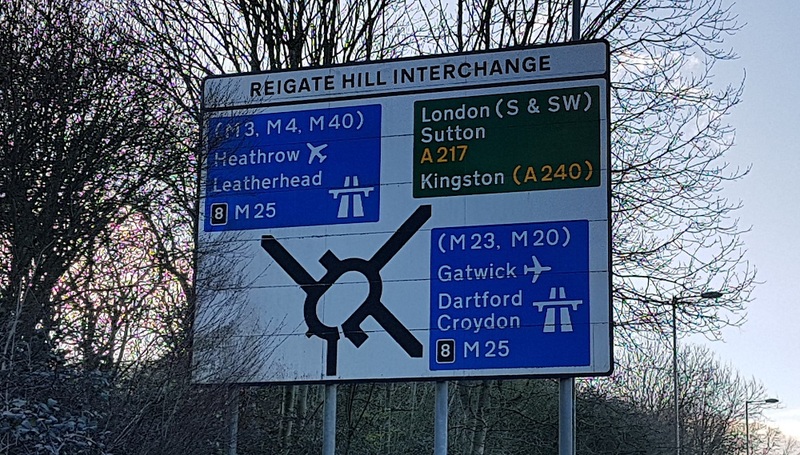 It’s unclear when work will begin on a project to improve Junction 8 of the M25 and the road layout at the top of Reigate Hill, other than the official line of “Spring 2019”. Reigate.uk understands that work may not begin until after the Epsom Derby at the start of June, but a Highways England spokesperson confirmed last week that “Spring 2019” is all they can say for now. The aim of the scheme is to improve the junction’s operation and safety, and address the problem of traffic backing up on to the roundabout. The A217 southbound will be widened at the top of Reigate Hill, with two lanes heading off the roundabout towards Reigate, merging shortly before the Wray Lane junction. A new slip lane will run to Gatton Bottom, starting after the bus stop, meaning there’ll be three lanes at that point. Enabling works – such as surveying – are currently taking place, with traffic cones recently set up at the roundabout. The plans haven’t been subject to public consultation. County and borough councillors have from time to time discussed the matter at quarterly meetings of Surrey County Council’s Local Committee for Reigate & Banstead, although it didn’t come up at the last meeting on 4 March other than a brief note in the meeting papers. Councillors have however had fuller informal briefings from Highways England, most recently in January. County Cllr Jeff Harris, who chairs the committee, said last week that members still have a number of unanswered questions about the scheme including timing and where the site depot will be located. Previously the committee has raised concerns about the project’s cost (borne by Highways England), which last year was said to be £4 million. The cost figure is currently listed as “TBC” on the Highways England webpage on the project.